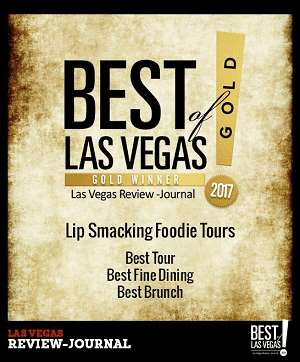 Recent winner of 3 separate awards for Best of Las Vegas 2017 (Best Tour, Best Fine Dining and Best Brunch) plus over 1,260 four and five star reviews on TripAdvisor, Lip Smacking Foodie Tours is the company to watch! When you are craving the ultimate taste of Las Vegas and you aren’t sure where to start, simply choose between a Boozy Brunch, an Afternoon Culinary Adventure, Savors of The Strip or a Downtown Vegas tour. If you’re looking for a more romantic or adventurous experience, reserve your spot today on the Savory Bites & Neon Lights tour which includes a helicopter flight over the famed Las Vegas Strip. 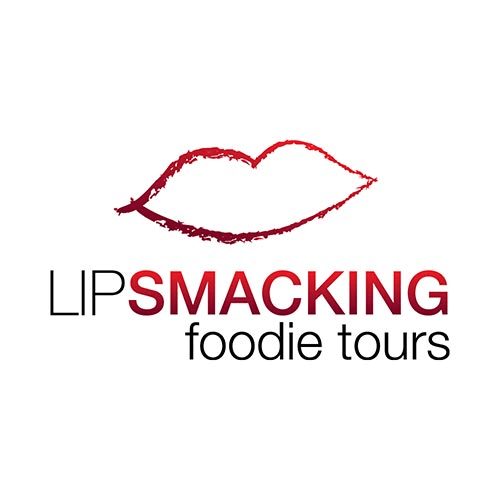 On all Lip Smacking Foodie Tours, guests enjoy the best signature dishes at carefully selected, top-rated restaurants who have built their reputations on having the most-sought-after food experiences in town. Tastings include dishes ranging from appetizers to entrées and desserts, which all together will provide each guest with a complete meal. The experience is spread out between 3-5 restaurants over 2 to 3 hours so guests leave completely full and satisfied. All taxes and gratuities are already included, so why wait? Book your experience today! Lip Smacking Boozy Brunch Tour: True connoisseurs know this first class foodie experience is the ultimate way to start your day! Complete with free-flowing cocktails and amazing food at 3 top restaurants on the Las Vegas Strip, this purchase also includes all taxes and gratuities, 3 upscale restaurants and a foodie tour guide. Enjoy everything from the finest sweets and savories along with uplifting cocktails or mocktails sure to energize, revitalize and leave you ready to take on Las Vegas. Afternoon Culinary Adventures: This 2 1/2 hour lip smacking adventure provides guests with an afternoon of strolling, eating and exploring Las Vegas’ hottest culinary venues on the Strip.Whet your appetite with this casual tour and enjoy signature dishes showcasing the city’s renowned food scene. Purchase includes all taxes and gratuities, 3-4 signature dishes at each restaurant and a foodie tour guide. Starting at 2:30pm, this afternoon experience allows plenty of time for other things later that evening. Savors of The Strip: Appreciate artsy plates and daring cuisines when you when book the crème de la crème of foodie tours today! Receive the ultimate in VIP treatment by getting whisked inside the exclusive doors of 5 of the most dynamic restaurants on the Strip. Purchase includes all taxes and gratuities and a foodie tour guide. This glamorous evening extravaganza is a show in and of itself as you sample adventurous and luxurious fare. 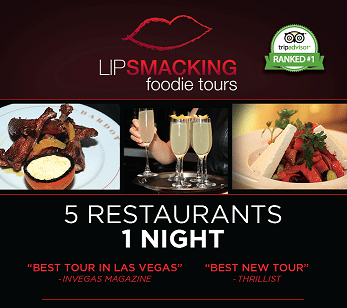 Downtown Vegas Lip Smacking Tour: Enjoy VIP treatment with the best seats in the house and specialty food and drinks upon arrival! Purchase includes all taxes and gratuities, 4 restaurants and an upscale bar. Enjoy a fabulous night on the town and see the vibrancy and rejuvenation of Downtown Las Vegas. Pulsing with reinvigorated energy, it has been transformed into the city’s most exciting food scene with chef-driven restaurants rich in personality and flavor. This delectable tour is led by an expert foodie guide and each stop features signature dishes by Award Winning Chefs. Savory Bites & Neon Lights: Combining the Savors of The Strip foodie tour with a breathtaking helicopter flight over the Las Vegas Strip! Zoom from first class to head of the class in this extravagant experience of a lifetime in which you’ll be whisked inside Vegas’ most exclusive restaurants for tantalizing treats before boarding a helicopter to take in a breathtaking bird’s eye view of the city’s unparalleled glittery glamour.